View More In Awards & Certificates. 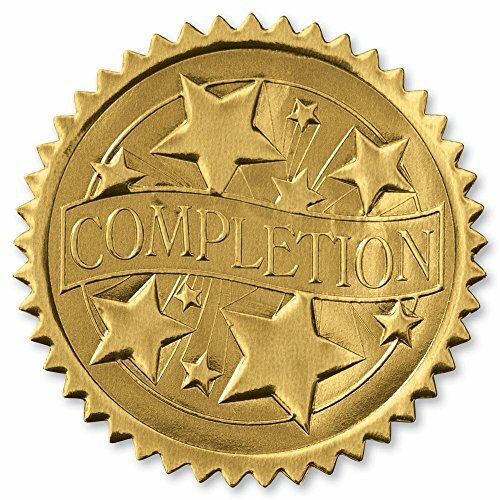 Mark the completion of projects, goals, study and more with these expertly-crafted Completion Gold Foil Certificate Seals. These beautifully-embossed gold foil certificate seals measures 2 inches round and feature a distinguished star design and the word Completion. The self-adhesive, serrated edge embossed gold foil seals come 102 per pack. Most of our seals come six seals per sheet for a total of 17 sheets. If you have any questions about this product by PaperDirect, contact us by completing and submitting the form below. If you are looking for a specif part number, please include it with your message.